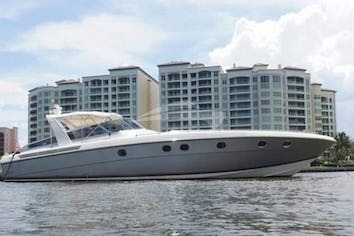 Introducing our ASTONDOA 81' Classic Motor Yacht M.I.S. MOONDANCE. All are welcome aboard this masterfully redesigned pleasure cruiser. M.I.S. MOONDANCE completed a top to bottom renovation totaling just over one million dollars in September 2015. Taking design cues from Miami's fashionable, glamorous resurgence; this yacht is reminiscent of the boutique hotels of South Beach's most decadent era. 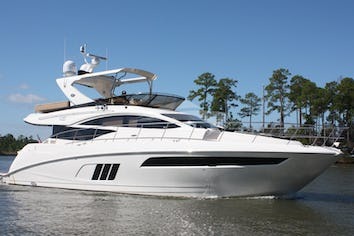 Bold and inviting this yacht provides an enchanting experience out on the water with up to 12 of your friends and family. M.I.S. MOONDANCE is wired with satellite tv, Siriusxm radio, bluetooth enabled surround sound and wifi so you'll have no problem playing your favorite music while we cruise to your chosen destination. If you're interested in exploring, skiing, tubing, snorkeling or fishing we have a 22ft speedboat with 150hp that will be coming along with us. Our M.I.S. 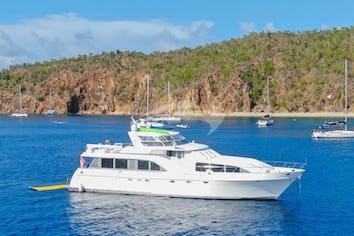 MOONDANCE and crew invite you and your guests to come aboard for a minimum of two hours but must ask you to leave after one week(it happens). We take sincere pride in providing a fun, safe and memorable experience for you and yours. Please feel free to call or text for more information. Thank you or taking the time to learn more about our cherished yacht. THESE PRICES ARE FOR DAY CHARTERS ONLY FOR FOOD & BAR PACKAGES ONLY ! 50% discount will be applied to wines from the top shelf . I hope you are well and enjoying a lovely Saturday. I just wanted to share Mis Moondance with you. I have chartered her for several day cruises in NYC and I have to say the feedback has been phenomenal. Each of my clients has decided to book again. I this competitive market, that speaks volumes about the pristine condition off the yacht and also Michael and his staff. The charter was great - amazing crew, we were lucky with the weather, all in all a wonderful experience for our team and clients. Thanks again for your help in organizing this! "Victor had a great time and cant wait to book again , He gave you number out to some of his friends so hopefully they will be calling you soon!" I appreciate all the help with making arrangements! Ur a great guy, that was my first impression of you, like We knew u for years! Thank You! We hope to meet up w you sometime? Have a glass of wine w us?